Lucid sells mattresses directly, and through big-box stores like Walmart, Home Depot and Amazon. Will this budget mattress fit your needs? Restful sleep comes from two layers of memory foam on a supportive high density foam base. This mattress features three layers that work together to create a medium-plush feel. At the surface, a 3-inch layer of ventilated gel memory foam hugs the curves of the body to alleviate pressure points. Beneath that, a 2-inch layer of ventilated bamboo charcoal-infused memory foam provides support and temperature regulation. The ventilated design of the memory foam improves breathability and comfort. A 9-inch thick high density foam base creates the support needed for comfortable, restful sleep. The mattress is wrapped in a cozy Tencel blend cover that helps to regulate moisture at the sleep surface. 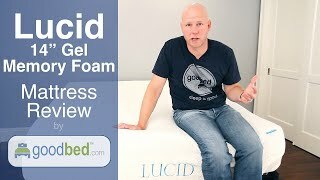 To decide whether Lucid is the right choice for you, read GoodBed's expert review of the Lucid mattress or watch our in-depth video review of the Lucid mattress. Is Lucid the right bed for you? Lucid mattresses are recommended by 55% of owners on GoodBed (based on 229 ratings + 2 reviews). Do you have something to say about your Lucid mattress? Write a Review! Quilt Cover Details: Humidity-controlling bamboo charcoal memory foam is quilted in a Tencel® blend cover (10% Tencel lyocell, 90% polyester) to form a cozy air layer. Mattress Thickness: 6" to 16"
Note: The product line specifications above were derived from the active Lucid models listed on GoodBed. As a result, these details may not be comprehensive and may not apply to all Lucid models. If you are seeking specifications for a particular Lucid mattress, please search for that mattress by name on GoodBed, or check with your local Lucid dealer. Lucid is a mattress manufacturer founded in 2016 that is based in Logan, UT in the United States. Lucid Mattress is affiliated with Malouf and Linenspa. Have an update or correction to our information about Lucid? If so, please take a moment to suggest an edit.